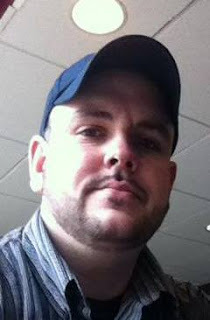 The Middletown Insider: Where Does Political Indifference End, and Treasonous behavior Begin? Where Does Political Indifference End, and Treasonous behavior Begin? We live an era where things people say have to be carefully thought out, and even after they’re thought out, they should be considered again. As a dear friend of mine who is a Sister of the Apostolate of the Sacred Heart of Jesus once told me, “It’s always better to write a letter for something you’re unsure of. That way you can let it sit for 24 hours, and if you still feel that way, then you can send it.” So it should ring true with everything we do, but in an age of post this and tweet that, it doesn’t seem to happen much. As a friend of mine pointed out, the library has always has been that way. And I won’t dispute that. 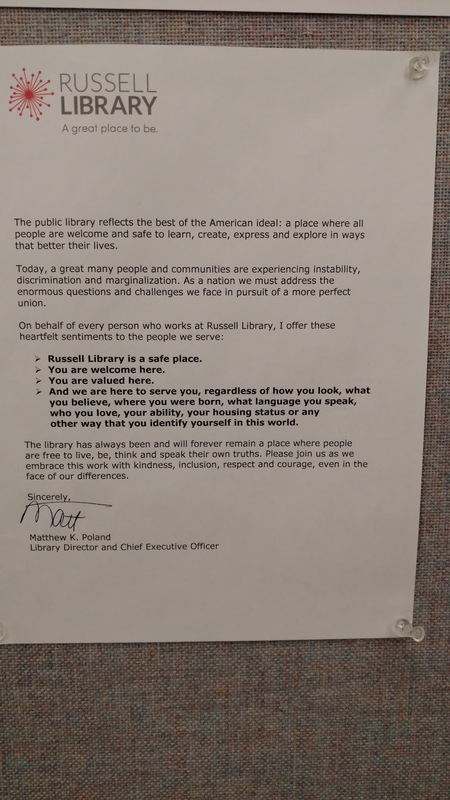 The Russell Library has always been accepting of anyone, even homeless folks, and for years, it’s never been an issue. Never. Ever. 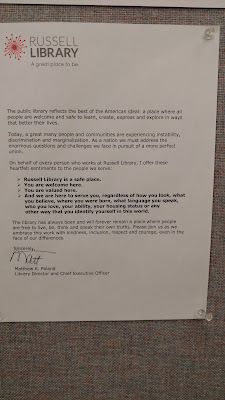 So, why now, of all times does the library need to, formally announce that it’s a “safe space” for people “…however they identify themselves in the world”? Could it be that our President has all but called open season on illegal immigrants? As many of you may have seen, WFSB did apiece on this earlier today, in which Mayor Dan Drew basically blew this off as nothing, saying, “Everyone is welcome.” Well, that’s not exactly breaking news, Mr. Mayor! It’s a PUBLIC Library! Of course everyone is welcome! Not to go full circle, but, otherwise it would be a PRIVATE Library! The timing of this whole thing is as suspicious as the wording of the letter. A letter that stinks of Dan Drew. I can’t imagine that someone such as Matt Poland has a vocabulary large enough to write such a letter. I’m not sure if everyone knows Mr. Poland’s resume, but I’ll give everyone the 5 Cent Tour: After a contentious period on the Hartford Board of Education, where he was known to send vicious emails to people that opposed him (see jonathanpelto.com February, 14, 2014); He also served as CEO of the Hartford Library, where in 2015, he was given the Golden Handshake when the Segarra years were over and Luke Bronin took over as Mayor. So, Middletown, feel proud we have Hartford’s trash running our library. In case anyone was really wondering what I thought of him, well, the verdict is in, and it doesn’t look good for Matt Poland. I understand that we live in divisive times. President Trump is going about things in unusual ways. But, that’s why we voted him in as President! You can’t tell me you’re surprised about a thing he’s doing, because he said everything he was doing to do during the campaign! The American people are the fools, because we are so used to Presidential Candidates who say 1000 things they never do, and we’re conditioned to that. However, within the last week, President Trump drew some pretty tough lines when it came to illegal immigrants, and of course people became upset. I’d be willing to bet that everyone knows at least one person here illegally. (Whether you know it for certain, or not) I have a very good friend who is an illegal alien from Nicaragua, and I’d take a bullet for that man. However, there is a very real chance he’ll be sent back to Nicaragua. Am I happy about that? Absolutely not. But, ultimately, I played a role in it if it happens. I voted for President Trump. But to turn a Public Library in to a “Safe Place”? I’m not even sure what that means. So, tell me Matt Poland, & Dan Drew. What does that mean? If ICE comes in to town, and starts to round up people and they run to the Russell Library, does this mean that ICE can’t touch them because they’re in your “Safe Space”? Hell No, it doesn’t mean that! Either one of you would probably sell out your own wife, or husband, as long as they don’t get any blood or spit on you! Whether it’s Dan Drew in his Ivory Tower on DeKoven Drive, or Professor Snape on Broad Street, both of you live in some sort of fantasy world far away from where reality actually goes on. If you want to set up a “Safe Space” for Illegal Aliens, then just do it! And call it what it is! Don’t leave some vaguely worded letter, supposedly written by some Harford Library dropout, on a Bulletin Board, next to a picture of a Muslim Woman in a hijab. In my closing remarks, I will say this, I think I made it clear that I firmly believe this was orchestrated by Mayor Drew at City Hall. It further seems Mr. Drew has fantasies about being Governor someday. Perhaps I’ll actually start forming my exploratory committee to run for Governor as well… Isn’t the American Political System a grand thing?